Rediff.com » News » Did IAF use a secret bomb at Balakot? The IAF has insisted it hit its targets. If that is indeed true, then the lack of obvious damage could mean it has used a different bomb -- possibly procured secretly from Israel. Army bomb experts said if the Indian Air Force had used SPICE 2000 precision-guided bombs to strike the Jaish-e-Mohammad camp in Balakot, Pakistan, on February 26, they would have utterly demolished any regular brick-and-mortar buildings they hit. The IAF has insisted it hit its targets. If that is indeed true, then the lack of obvious damage could mean it has used a different bomb -- possibly procured secretly from Israel. This contention that 70 to 80 kg of explosive would spare the building is disputed by Major General Manik Sabherwal (retd), the army explosives expert who was called in to reconstruct the explosive devices that killed former prime minister Rajiv Gandhi in 1991 and then Punjab chief minister Beant Singh in 1995. "A bomb with 70 to 80 kg of military grade high explosive would destroy a two- or three-storey building. Its roof would be blown off, and most of its walls," General Sabherwal said. Describing 70 to 80 kg as "a hell of a lot of explosive", General Sabherwal pointed out that an anti-tank mine, which can rip open the belly of a heavily armoured tank, weighs just 5 kg and a 155-millimetre artillery shell, which can bring down a building, contains just 12 to 15 kg of explosives. There has been international scepticism over India's claims of having killed a 'a very large number' of terrorists in Balakot. The anonymous officials who briefed the Indian Express explain this by claiming that the bombs used against Balakot are so specialised that they only made a small hole in the roof. IAF sources have also made another claim to explain why the Balakot camp buildings are still standing. They say SPICE 2000 munitions are 'bunker busting' weapons that explode only after penetrating the ground, diminishing their destructive power. Rejecting this, General Sabherwal said: "A bomb's shock wave passes through solid medium like soil even more efficiently than through air. So if the bomb passed right through the building and exploded under it, that would create an even more disruptive shock wave that would disrupt the foundations of the building, bringing it down." Describing the effect on a building, another army bomb expert who requests anonymity since he is still serving, assesses: "70 to 80 per cent of the building would collapse, with only a part of the outer walls standing. The rest would be rubble." That again raises the question: did the IAF use a bomb with specialised effects, about which no details have been made public yet? Air Marshal Nirdosh Tyagi, who headed the IAF's equipment acquisitions, says the acquisition of the SPICE 2000 started in 2007 and took two-to-three years of trials to finalise. SPICE -- which is an acronym for Smart Precise Impact and Cost Effective -- is only a guidance kit that must be mated with a bomb, usually the Mark 84 bomb. Before it is launched from an aircraft, the SPICE is loaded with the target's precise latitude and longitude coordinates, towards which it is guided by a navigation unit that takes inputs from Global Position System satellites and an on-board Inertial Navigation System. As it approaches the target, a visual seeker switches on and, using 'scene matching software', homes in on the target, the photograph of which has been fed into the seeker before the mission. Air Marshal Tyagi says, and this is corroborated on the website of Israeli company, Rafael, which supplies the SPICE 2000, that it can be launched from 60 km away from the target. 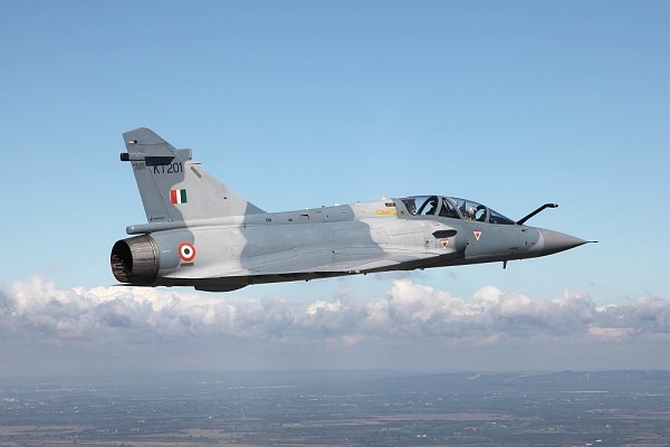 That would have required IAF Mirage 2000s fighters to ingress at least 20 km across the Line of Control before releasing their SPICE 2000 bombs towards Balakot. But IAF sources have been emphatic that the Mirages did not cross the LoC.